Rob Gard, Communications Director at the Greater Madison Convention and Visitors Bureau. One great thing about college towns is the cost of living. Broke students inhabit these magical places nearly year-round, except for the mass exodus that often happens in the summer months or around the holidays. So when summer rolls around, it’s a good time to see places like Madison. Known for being Wisconsin’s capital, Madison is also closely associated with the Wisconsin Badgers and an affinity for beer and cheese. Recently, we had a chance to sit down with Rob Gard, Public Relations and Communications Director at the Greater Madison Convention and Visitors Bureau, to get the lowdown on all the affordable activities the city offers from a local’s perspective. What brings the most tourism to Madison, and what are some of the can’t-miss attractions? We have such variety here. Among the things that drive people back to Madison is the access we have to outdoor activities all year round — even in the winter, which surprises some people when they think about Wisconsin winters. But especially in the summer, the city comes alive like no place that you’ve seen. We have five lakes that surround Madison, and a lot of the year-round activities center around the lakes. There are about 200 miles of biking and walking trails throughout Madison — a number of which wind along the lake shores. You get some wonderful interactions with nature, but you’re in the heart of a city so you can pop off a trail at many points along the way to explore distinctly interesting neighborhoods and restaurants or just explore the city. If you come to Madison during the summer, we have the Dane County Farmers’ Market, which is the largest producer-only farmers market in the country. You can walk around the market for free and hear some music, check out the scenes, and get tremendous deals on fresh produce, artisanal cheeses, and fresh-cut flowers. What is the most popular time of year to visit Madison? Madison is a college town, so at the end of the school year, a number of students leave town, which creates a different type of energy in the town because then you have an influx of tourists coming in — singles, families, people of all ages — and Madison really thrives all summer long with that influx. There are free concerts on the Capitol Square — classical music concerts for part of the summer and then free jazz concerts for the latter part of the summer. Other venues throughout the city have free live music all summer long. 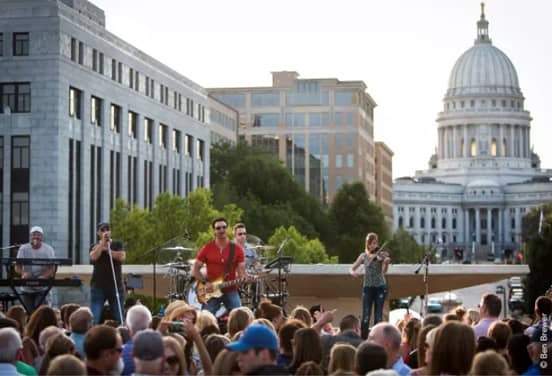 Live music events happen frequently in Madison’s Capitol Square. What’s interesting is, as cold as Wisconsin can get in the winter, it can get pretty humid and hot in the summer. We have a lot of free, air-conditioned places that people can take advantage of. We have several museums that are free; Madison Museum of Contemporary Art is something people can duck into to beat the heat and see thought-provoking art from around the world. We also have the Chazen Museum of Art, which is part of the University of Wisconsin campus. What are some popular local dishes or restaurants to try that won’t break the bank? Luckily, being here in Madison, eating out is certainly a lot cheaper than your larger metropolitan areas, but the food is just as good. We have James Beard Award-winning chefs here, and we have a lot of innovative flavors that are happening. If you want to go old-school — if you’re here on the weekend — head over to Short Stack Eatery for some really good breakfast food that’s inexpensive. If you’re here during the week, there are food carts that populate the Capitol Square and the Library Mall down at the university. We have several dozen food carts with really flavorful meals that reflect the passion of our food cart chefs for under $10, and you can really walk around and get some tremendous flavors. Even our upscale restaurants are very affordable compared to what you’d find in larger cities. Being in Wisconsin, we’re big on beer, cheese, and happy hours, so you can find great deals. Places like Great Dane, which is a brewery right around the Capitol Square. Also The Coopers Tavern or The Old Fashioned. You really can’t miss when it comes to happy hour pricing around here. There are festivals throughout the summer. We have things like Brat Fest, which is the world’s largest festival of brats. And, of course, you can’t have a brat without a beer. And in Sun Prairie, just outside the city, there is the Sweet Corn Festival in August; something like 100,000 people show up there. What are some affordable ways to get around town? We have this company called Madison BCycle, which is in a number of cities, where you can rent bikes from station to station at a pretty low cost. That’s actually an interesting low-cost way to go from event to event or from station to station. The great thing about having 200 miles of bike paths is you can work off that beer. Do you have any advice for tourists looking for affordable lodging in and around Madison? We have very competitive hotel room rates here. People are welcome to check out our website, which has a portal into booking rooms. We work with our hotel partners to offer rates that are affordable. 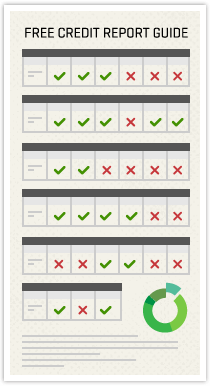 You can check it out to see when is a good time. For example, we are hosting the Reebok CrossFit Games in August, and you’re probably not going to find a hotel room within 50 miles of Madison, so do your research ahead of time, and we’re happy to help facilitate that. Just keep an eye on when the big festivals are and certainly when the Badger football games are because those weekends book up pretty quickly. What do you think makes Madison stand out as a US city? We are an active community at all age levels and at all income levels, and the energy and excitement that we feel for our natural outdoor attractions, for our cultural attractions, for our farmers’ market, and for our restaurants resonates among visitors. When you step into Madison, you are swept up into that spirit. I think that’s kind of an intangible aspect to the city, but it’s one that’s palpable when you come here for a visit.